Fujitsu and Lenovo – Using the MacBook Air CPU? The PC industry is wasting little time getting in line behind Apple to use Intel’s spiffy new notebook chip. CNET News.com has learned that Lenovo and Fujitsu are in the process of putting together systems based on the special Core 2 Duo chip that Apple is using in the MacBook Air. The new laptops should be out shortly, according to sources familiar with the companies’ plans, and will give customers a chance to see what the rest of the PC industry can do with the power-thrifty chips. Now Intel did say they would eventually offer it to other companies to use in their laptops, and the article mentions that the tech behind the CPU will be in the Montevina platform released by Intel later this year, for low-power ultraportables and UMPCs. As to whether or not it will be used in Lenovo’s ThinkPad X300 (their 13.3″ widescreen 2.5 pound offering) or the Lenovo IdeaPad U110 an 11″ laptop, it’s hard to say – both of those laptops appear to be pretty far along in their development/production phase, and the CPU will require a new systemboard. The U110 makes perfect sense because of the size, but it’s hard to say. As far as Fujitsu is concerned – well, they offer all kinds of different sizes and form factors, so there’s no telling where it’ll find its home. I would almost bet that some future version of the P8240 / P1620 would end up using this CPU. The U810/U8240 platform is just a little bit too small (possibly) given that this CPU does use more power than Intel’s Low Voltage and Ultra Low Voltage offerings. This entry was posted in Apple, Fujitsu, IBM/Lenovo, Intel, Rumors. Bookmark the permalink. 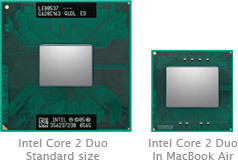 ← MacBook Air’s CPU in Non-Apple Laptops?